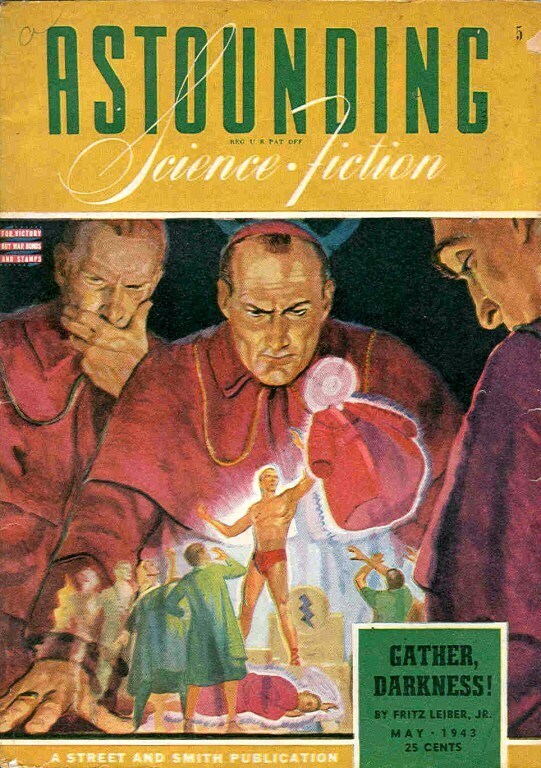 Science fiction has frequently made use of the idea of religion as a form of crowd and societal control. 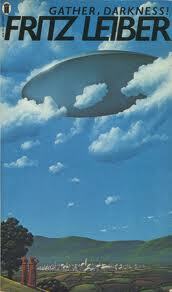 Asimov used it, to the benefit of civilization, in the early sections of the “Foundation” series. 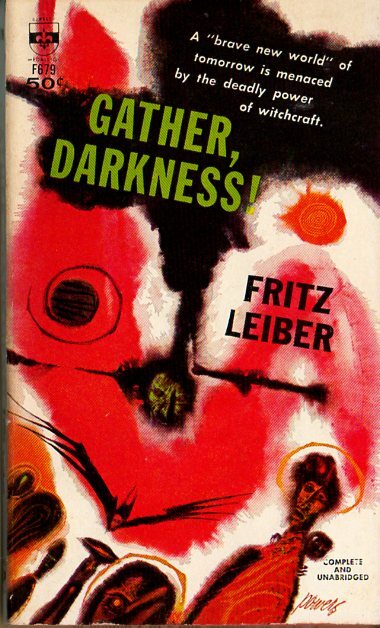 In Gather, Darkness!, Fritz Leiber examines the other side of the coin. Megatheopolis forms the arena for Leiber’s tale as well as serving as the center of the world-wide religion worshipping the “Great God.” Created after a civilization-destroying war which is described by the renegade-priest Jarles in the early chapters of the novel, this religion is used by scientists in an attempt to help civilization rise from the ashes. Unlike Asimov’s Foundation, the priests of Megatheopolis (who all know the background of their religion) have become corrupt and tyrannical. Armon Jarles, a priest who turns his back on the Hierarchy at the beginning of the novel, is the first indication of the rot within the religion, but there are other indications. Leading the Hierarchy are the three rival factions of “Realists,” “Moderates” and “Fanatics.” Although the Moderates seem to be attempting to continue the religion’s stated goals, the Realists tend to take a harder line against dissent among the masses. Chief among the Realists is Goniface, who is determined to maintain control over the commoners at any cost. Once Jarles leaves the priesthood, he quickly discovers the existence of an underground movement, known as the Witchcraft. Although the Hierarchy has frequently made use of allegations of witchcraft against various commoners, they do not appear to be behind this movement, whose goal is the Hierarchy’s overthrow. Although Jarles sympathizes with their views, he is less than supportive of their “ends justify the means” mentality, afraid it will simply lead to the replacement of the Hierarchy’s tyranny with one led by the Witches. 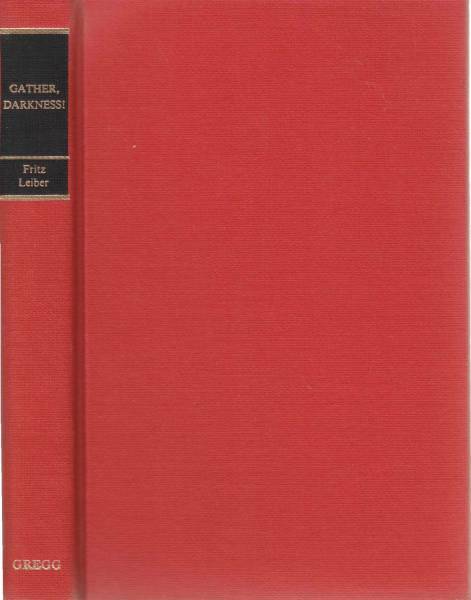 Miracles and magic are commonplace in this world, set four centuries in our future, yet each incident of magic may be explained by advances in science, for Gather, Darkness!, despite its Gothic feel is a science fiction novel. The gizmos used, to various degrees of efficacy for varying causes, never push the characters using them off-stage. 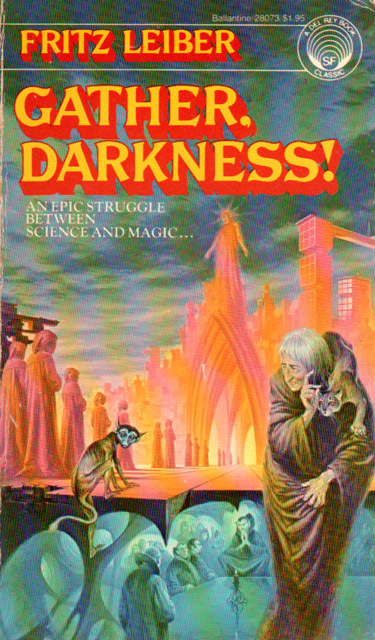 Perhaps one of the most interesting scenes is the priestly attempt to exorcise an haunted house. Unlike most exorcisms, in which the priests are creating their own evil spirits, this house is haunted by the mechanizations of “The Black Man,” a leader of the Witchcraft with a nasty sense of humor and foundness for practical jokes. 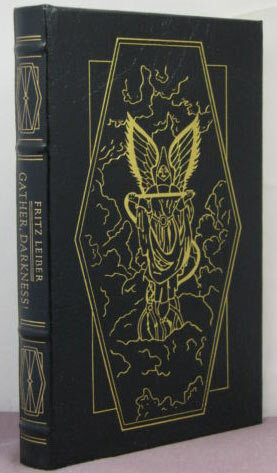 Leiber does a good job with nearly all his characters. Arles, Goniface, Cousin Deth and even Brother Chulian are very well drawn and have their own personalities. If one or two characters are not as well drawn, that can be ignored. 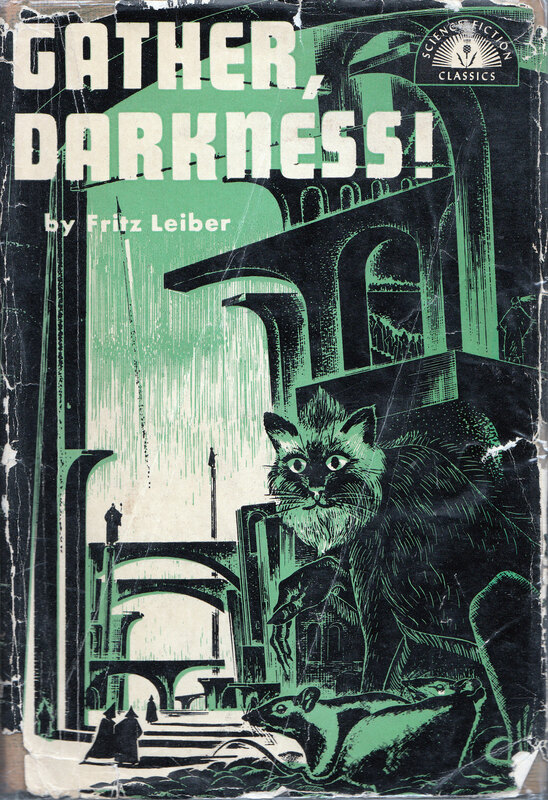 Despite this book’s short length, Leiber works in several major characters, switching viewpoints a little too frequently for plot continuity, but still able to manifest the personality quirks which make these characters come to life. The plot does have some holes in it. The Witchcraft seems to be a little too well organized given their situation and the difficulties they face. 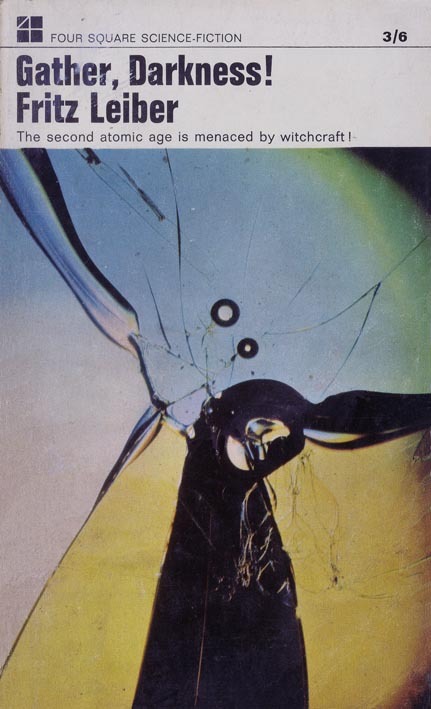 Once their existence becomes known, quite suddenly it seems, the Hierachy discovers everything about them. 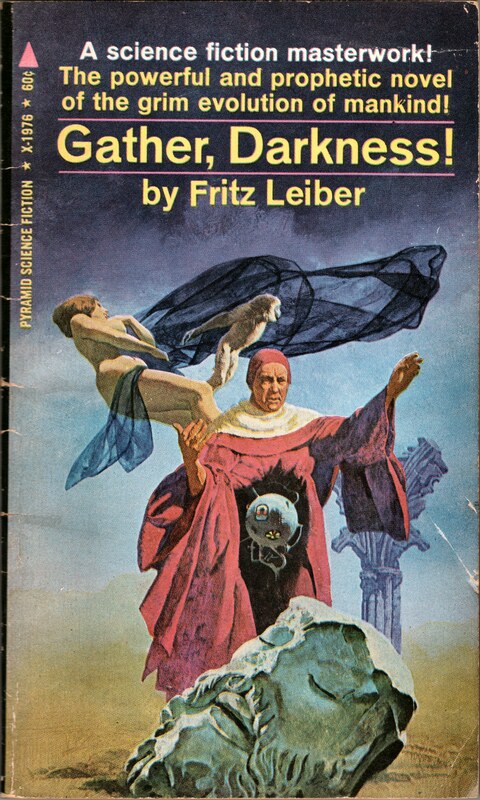 Leiber introduces a little history of the world at the very end of the novel which fleshes out some of the events, but could (and perhaps should) have been introduced earlier for a stronger book. 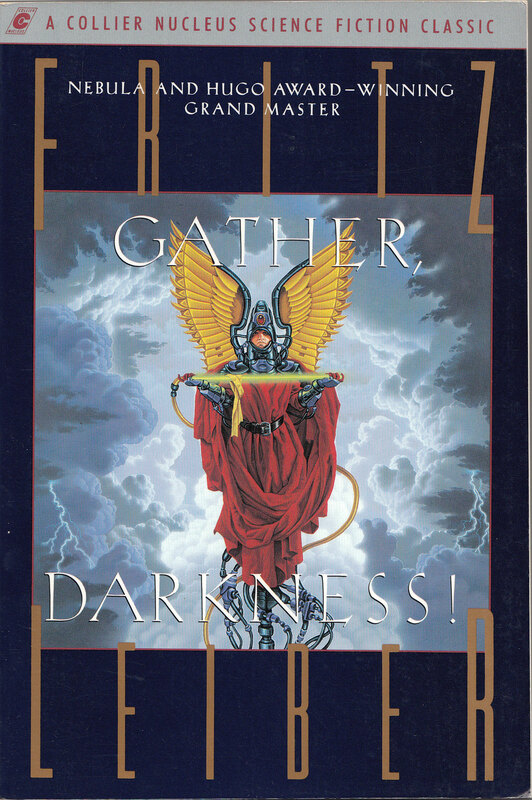 Despite these flaws, Gather, Darkness! is a strong novel. 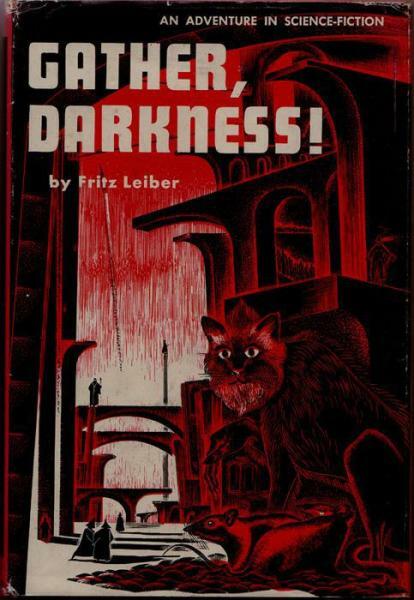 While I’m sure there are many things Leiber would have done differently if the book had been written in the 1990s, it still holds up extremely well after fifty-five years and deserves to be read more widely than it is.